I began my career with Farm Bureau Insurance in 1996. 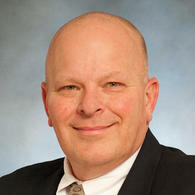 I have worked as an insurance agent since 1986. I earned my Life Underwriting Training Council Fellow (LUTCF) designation in 1991 and have since continued my education in insurance planning. The ongoing training, combined with the years of experience have given me the knowledge and insight to help my customers build an insurance portfolio that suits their needs and budget. I am married with three grown children. My wife and I are lifelong residents of Washington, Missouri. I enjoy working with my clients to help them with their insurance needs and look forward to earning your trust and business.